An Apex Court Bench comprising Justice J.S. Khehar and Justice A.K. Goel yesterday delivered its order in the infamous 2002 Nitish Katara murder case, upholding the findings of the trial Court and the Delhi High Court. The Court however, agreed to look into the aspect relating to the quantum of sentence awarded to the three convicts- Vikas Yadav, his cousin Vishal and, Sukhdev Pehalwan. Notice has been issued to the Delhi Government on the scope of punishment and reply has been sought within six weeks. Senior Advocate U.R. Lalit opened his arguments saying the three convicts have been awarded life term for one injury on the head of the victim. The bench however refused to accept this contention, stating that such things happen in honor killings. The bench refused to accept the submission that key prosecution witness Ajay Katara, who had last seen the victim alive in the company of the three accused in a Tata Safari car on the intervening night of February 16-17, 2002 at Hapur Chungi in Ghaziabad, was a "planted and fabricated" witness. The Bench in fact lend credence to witness Katara, saying that he had shown and "if you (advocate) cannot dent Ajay Katara then we are not with you." It reportedly remarked that almost of all prosecution witnesses had "resiled" from their statements in the trial court and said, "This shows how much power you wielded". “Show us something glaring. Otherwise, we are not with you," the Bench added. The senior advocate tried to discredit Ajay Katara’s testimony, saying that the witness, who lived in Shahadara, had his scooter broken down on the middle of road near Hapur Chungi around 12.30 am forcing the Tata Safari Car to stop behind him. He then reached the Police Station after a month of the incident, and gives statement that he identifies the three accused whose photographs were all over, including television channels, driving home the point that he was a “planted” witness. The Court however rejected this argument, along with the referral made to the testimony of the Investigating Officer Anil Samania. The Bench said that they have been provided with enough “indulgence” from the High Court and accused them of wasting “judicial time”. "Nitish has got justice. This is a huge victory. I am vindicated, it's a big day for all of us," Neelam, the mother of Nitish Katara told NDTV. 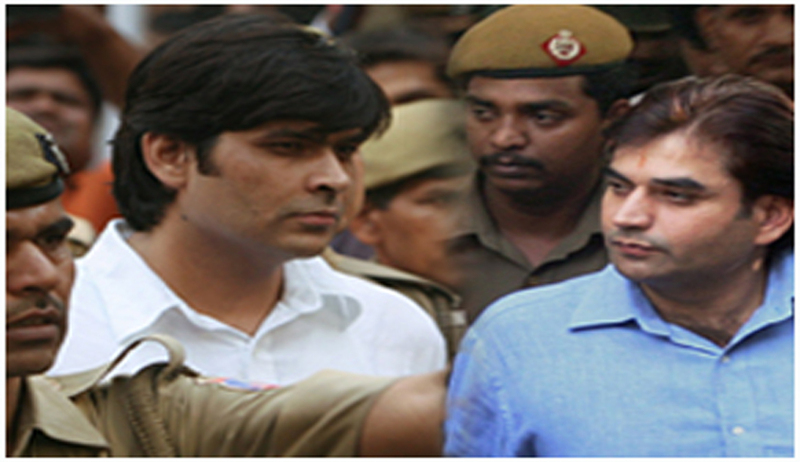 Earlier in February, refusing to award death sentence to Vikas and Vishal Yadav, a Division Bench of Delhi High Court has via a detailed 594 page judgment turned the life imprisonment (LI) to 25 years of actual imprisonment without consideration of remission and a fine of Rs. 50 Lakh each u/s 302 along with rigorous imprisonment (RI) of 10 years under Sections 364/34 IPC which will run concurrently with the sentence given under Section 302/34 IPC. The Division Bench comprising of Gita Mittal & J.R. Midha JJ stated that the removal of all sources of identification and burning of the body beyond identification was part of single premeditated plan u/s 201 executed by the defendants. They were hence awarded RI for 5 years with fine of Rs. 2 lakh, with the sentence running consecutively to the 25 years of actual imprisonment awarded to the defendants, making it 30 years of imprisonment in toto. You may read the LiveLaw story here.